In two days Owen will have half of his left lung removed. Am I afraid of having my baby go through such a major surgery? Absolutely! This isn’t the first time I’ve faced a surgery that filled me with fear. At the age of 15, I learned I needed jaw surgery. I resisted the idea completely but finally agreed after persuasion from orthodontists, oral surgeons, and my parents. The biggest fear I had with jaw surgery was throwing up. You see, when your jaw is wired shut (as mine was for six weeks), the act of vomiting can be fatal. My surgeon instructed me the carry wire cutters with me everywhere, just in case. I was afraid of the future and afraid of dying. Yet it was through this surgery that God changed my life forever. I had a lot of questions about death and heaven. If I were to die, would I go to heaven? I went into surgery with these questions unresolved. Days later, I was actively seeking answers. It was Easter Sunday 1995. My face was still swollen from surgery, but I didn’t care: I wanted to know more about Jesus. Friends had invited me to their church’s Easter drama called The Passion Play. I attended, and it was there I found the answers I was looking for. For the first time in my life, I saw who Jesus was. I had never before understood His love for me, but suddenly everything was changing. I understood how Christ’s death and resurrection made it possible for me to be forgiven and start a new life with Jesus. In that moment everything became clear to me, and I knew exactly what I wanted. I believed. I followed Jesus. And I’ve never regretted it since. Now, 22 years later, I’m facing another surgery. This time it won’t be my own physical pain but my child’s. I’ve wondered what it will be like, wondered if I’ll really have the courage to do what is required of me. We’ve asked for healing. We’ve asked God to take this whole thing away. 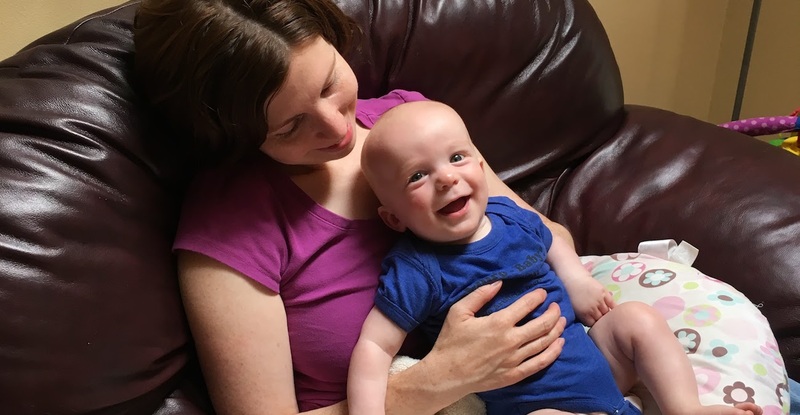 People from around the world have prayed for Owen, and God has answered in big ways. But to be free of his CPAM, Owen needs surgery. It’s scheduled for noon on August 18, and we expect a four-day recovery in the hospital. I don’t know the rest of this story, but I’m confident God will carry us through the tough times and use this for good. Amen! God is so good and He will bless you all and provide you with the peace of mind and heart as you approach the surgery and through the recovery. I will be praying for you all and for the doctors, nurses and everyone on Owen’s care team. Thank you so much! Everything has gone so smoothly! God is good. Yes, my jaw surgery was quite the ordeal, but it definitely turned out for good. We feel the same way about Owen’s surgery. Thanks for all your love and support! Love from all of us. Thanks for sharing this beautiful story, Jen. We are so glad that you found the answers you were looking for at age 15 and that God brought you into Aaron’s life during your college years. We’re also glad that Owen has you for a mommy and Aaron for a daddy. Blessings on you all as you go through this part of your journey. May God use it for His glory and for Owen’s good. God is good! God is always with us; never deserting us. God will be with Owen, the surgeons, and everyone who loves him. Sit quietly while Owen is in surgery and you will feel not only God’s presence but also his peace. Praying for Owen and everyone who loves him. God Bless you all. We certainly felt God’s peace during surgery! Thank you for praying. Jen, our men’s group prayed for you and Owen this morning, and I shared a little of your story too! May God assure and comfort you as we together put Owennintp God’s hands through the surgeons tomorrow. We will all be praying (Kaisers are here with us) today, for God to guide the hands of the surgeons in Owen’s healing, and for hearts resting in assurance of God’s love and goodness for mom and dad, grandma and grandpa. Thank you so much! We felt so much peace during surgery–definitely an answer to prayer. Dan and myself will have you all in our prayers today. Thank you! We could feel people were praying!